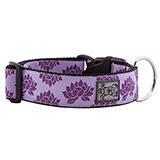 RC Pet's Wide Clip Collars feature attractive, contemporary styling, bright patterns, with soft and comfortable webbing. The easy-to-operate clip is rated at 250lb break strength and the D-ring is nickel plated for durability. RC Pet's Wide Clip Collars are easy to care for. Simply machine wash cold on delicate and hang dry. For better results, pre-soak with Nature's Miracle, Simple Solution, or similar enzymatic cleaners.